… bear with, this is fashion related I promise. Isn’t there an official Random Acts of Kindness day in February? or is it November? At the very least, there is a Foundation dedicated to the subject with numerous websites full of ideas as to what Random Act of Kindness you could carry out… you know, putting a little ‘surprise’ love note in a lunchbox for your kid or spouse, or complimenting a stranger on their outfit… that kind of thing? So last Wednesday, whilst the oldest child was having his swimming lesson, and, the bad parent that I am, I let the 4 year old play on the ‘family’ iPad instead of doing his reading with him so that I could flick through Grazia with one hand whilst scrolling through my Instagram with the other… a Direct Message alert popped up on my Instagram. 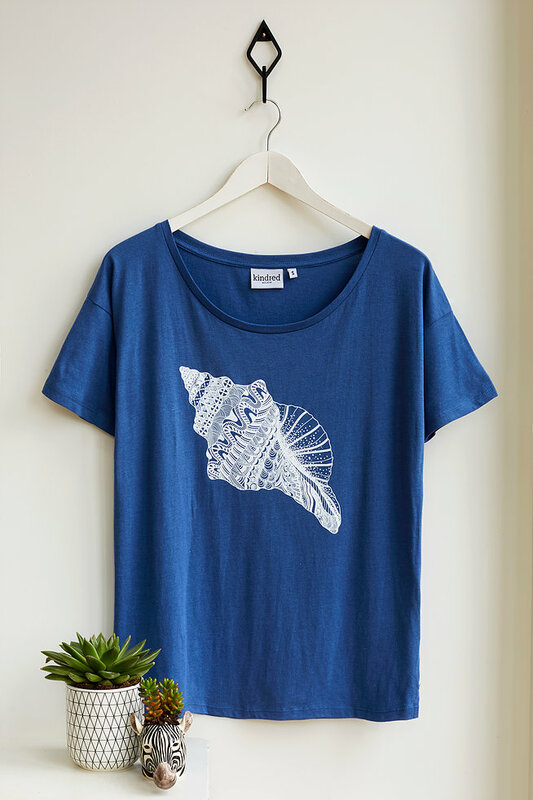 It was from Hayley, the founder of Wear Kindred, a small independent brand selling 100% ethical cotton t-shirts and sweatshirts with fabulously curated illustrations and art. She’d messaged me to let me know they’d just done a print run of their insta-famous Lip Sweatshirt in size XS and that she thought I’d look great in one – could she send it out to me? Now, I know what you’re thinking: “boring! Blogger gets a freebie… ” but… there is a little back story to this. 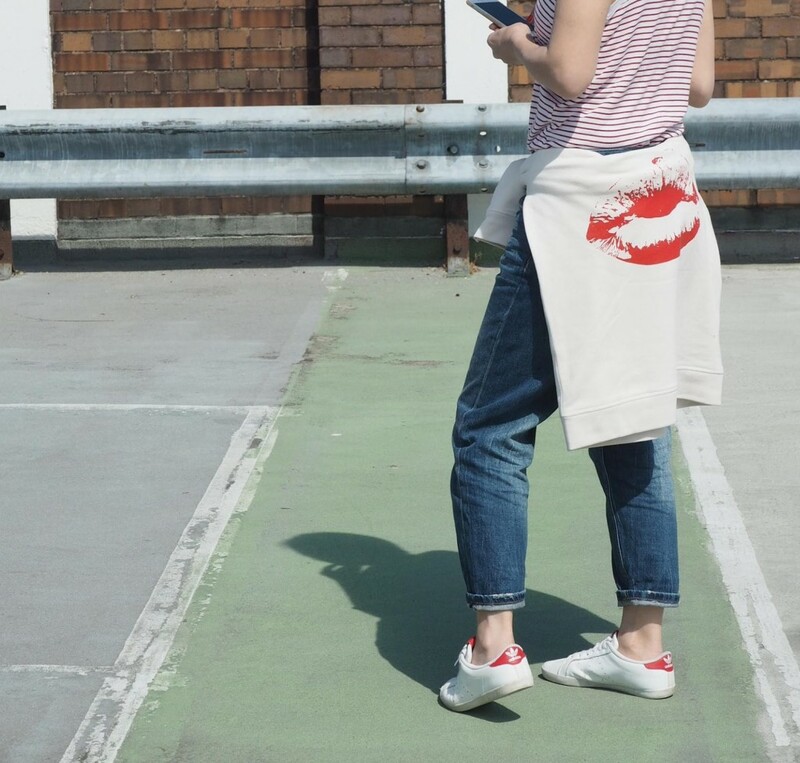 When I first joined Instagram a little over a year ago, I saw Fran (The Fashion Lift) wearing a Lip T-shirt and fell in love with the tee. I promptly followed Wear Kindred so that I wouldn’t forget of the brand’s existence – which, in this day and age of brands galore, is actually easier to do than you might think. A few months later, once I’d saved some pennies, I’d messaged Haley at Wear Kindred to get details of sizing of a sweatshirt, as I wasn’t sure whether the size S would be too big etc; she kindly sent a message back to say that a print run of size XS was in the pipeline. A few months passed and I pretty much forgot about it. Until last Wednesday when Hayley’s message popped up. So of course I jumped at the chance of being gifted a sweatshirt which I had more than a little love for. But – not at all. It would be de rigour to post an outfit shot on my Instagram, but definitely no requirement to blog about it. However, for me, being gifted this sweatshirt was (and is) a big deal. 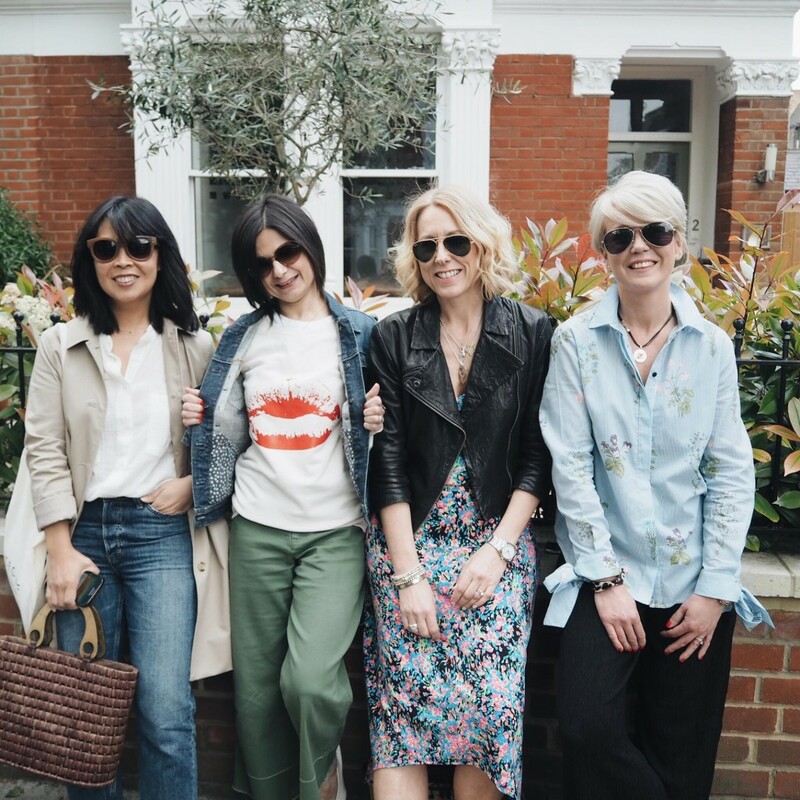 When I started blogging, I had never (ever) been on (any) social media and was totally naive to the whole ‘bloggers working with brands and collaborations’ and so on; I had simply never really thought about it. 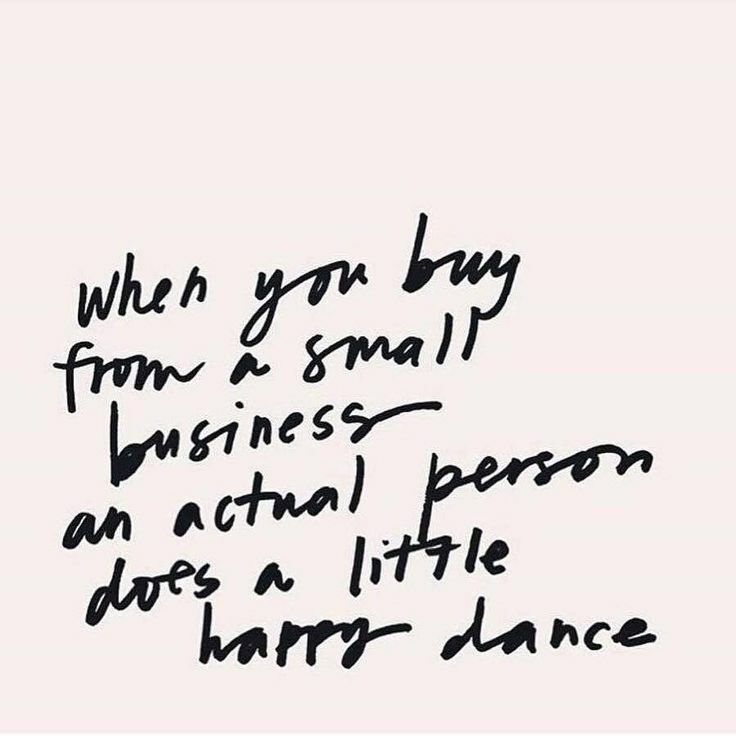 And now, a year into my blog, regardless that I might have my ‘petites’ niche, I can’t imagine that I could ever work in partnership with a brand. I’m nearly 46, I’m super small, my face is… well, my face (!) which I can’t imagine ever being one to fit in with any brand and so, I’ve resigned myself to just blogging for the ‘love of it’. I know you must think I don’t get out much when I tell you: I couldn’t help but feel a tiny bit emotional. To me, it was a lovely little Random Act of Kindness. Now I’ve never been good at taking a compliment… if someone does compliment me, I feel compelled to gush back at them to the power of 100! 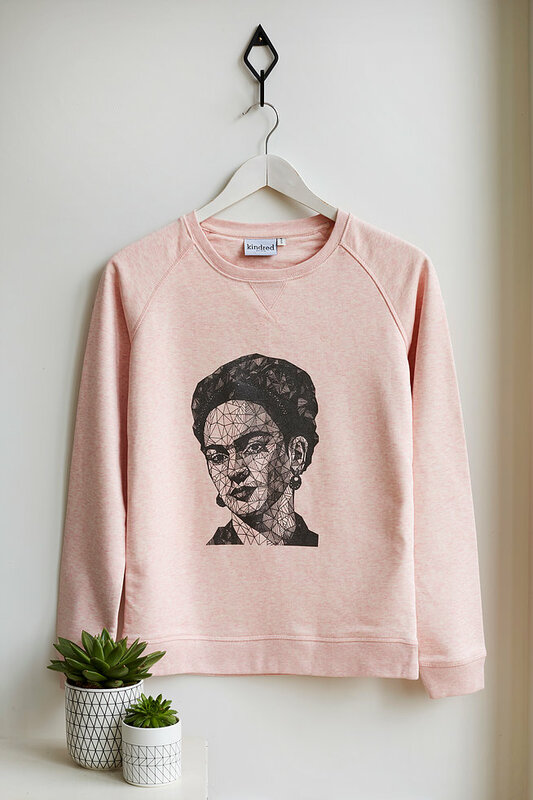 Beautiful Frida K on a sweatshirt! So the t-shirts cost £25 and sweatshirts come in at £40 and are all made from 100% organic cotton. My sweatshirt has such a lovely feel to it, so you’d be getting a great quality t-shirt or sweatshirt for your bucks. In terms of sizing, the XS is a great fit on little old me, but if you were after a slouchier fit, then I’d go for the size S.
We are at last coming in to dress weather, though it isn’t completely warm enough for me to not have a spare layer to hand; this sweatshirt looks really cute over a shirt dress, but would be equally at home over a midi-skirt as well. It’s a classic combo right? Wearing your sweatshirt with jeans and trainers. 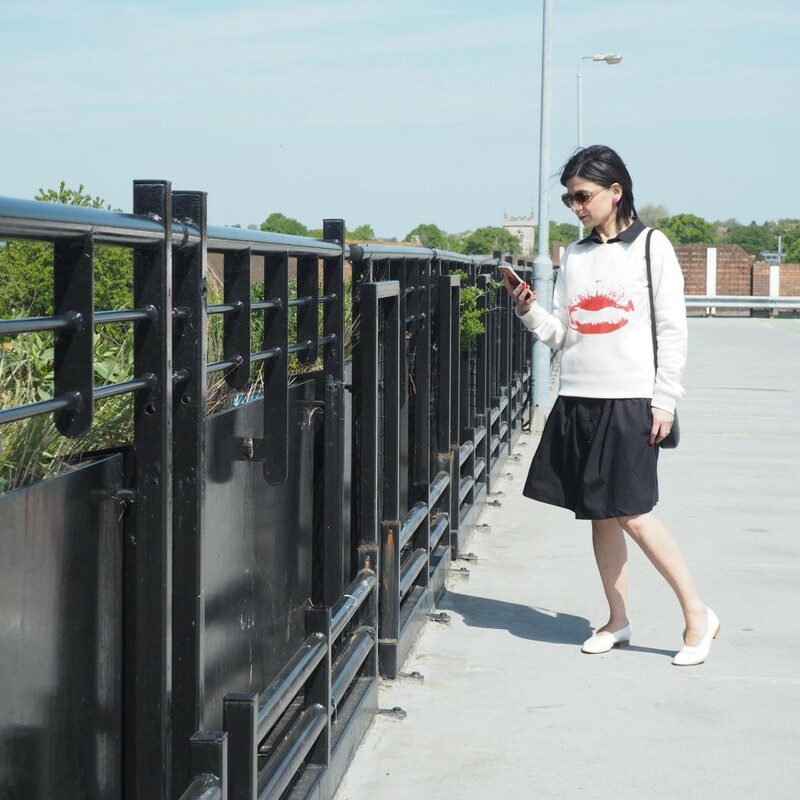 Do you remember how my husband was kind enough to go into Topshop Oxford Circus to find me the trousers I’d been after (which I talked about in this post)? This wasn’t a true “random” act of kindness as such; I had after all chipped away at him until I’d worn him down so much, he relented… however, he did make it *inside* the abyss that is Topshop Oxford Circus and bought the trousers for me, even if they ended up being too big! Whilst I was in London on Saturday, I popped into Topshop myself, to see if the size 4 in the trousers would be any better, but in the end, they were out of stock. I mean, I couldn’t let *his* money go back to him?! Don’t worry, I did ‘fess up to it… luckily for me, Mr T just shrugged his shoulders and laughed about it. Perhaps not an act of kindness on my part though, eh?! 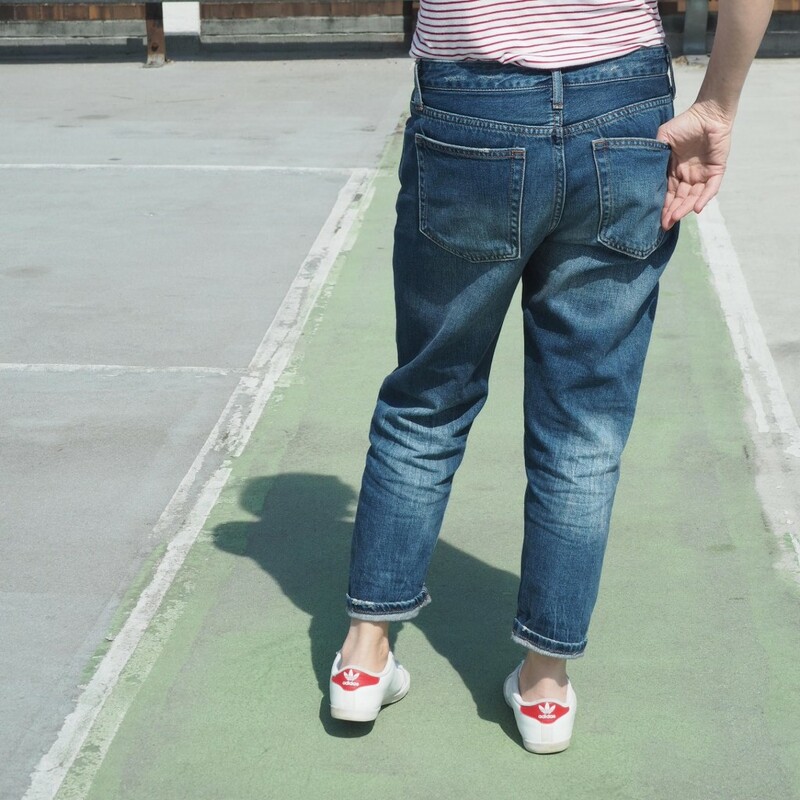 So… the boyfriend jeans… how do they fit? Well, my 10+ year old Topshop Baxters are a size 26, but my 7 year old pair are a 25… so I took both sizes of the Hayden Jeans into the fitting rooms with me. Because these jeans are a looser fit, made of 100% cotton (so have zero stretch in them) the size 26 fell straight off me, right down to my ankles. Well, actually my knee snagged them half way down… but you get the picture. Well, let’s just say they were giving Alexander McQueen’s 90’s low waists a run for their money. The size 25 didn’t fall off me, but they were dangerously low-slung. My knickers were on display… either that or I’d have to go for a Hollywood and show a bit of builders backside as well: NO ONE needs to see that! I do feel a bit like a 12 year old skate-boy in them as they are mega baggy across the thigh. And I’m pretty certain a stylist would say “no!” to them on me, as ultimately, they probably make me look shorter than I am. But… they are mega comfy and I’m loving wearing them at the mo. As you can see, they’re probably not the most flattering on my backside. Again, I basically don’t mind! 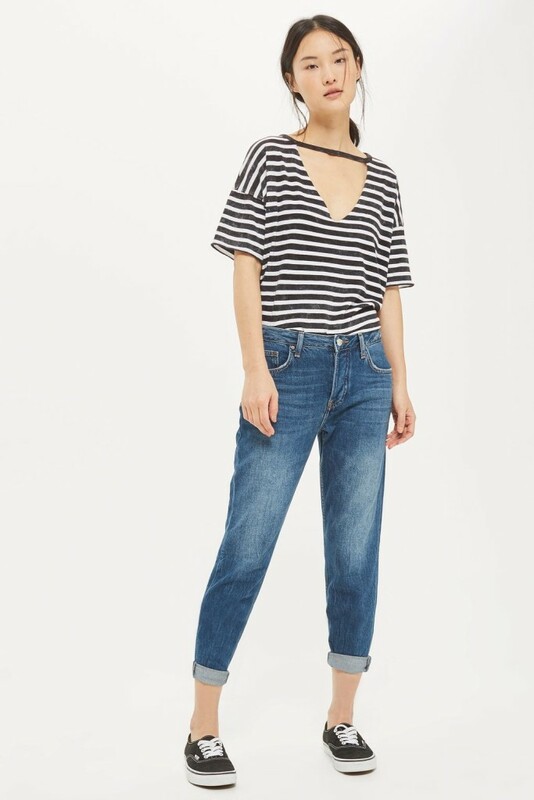 What I will say of these Hayden Boyfriend Jeans is this: they “grow” a little as you wear them… in the way that 100% cotton jeans often do; nothing that a quick hot wash won’t fix though. I’m looking forward to wearing them with a rolled-up hem, flip-flops and a little vest top for a beachy kind of vibe in the warmer weather which *is* coming (it has to! )… but until then, I’ll be slogan t-shirt-ing (and Lip Sweatshirt-ing!) it with them. And that’s it from me until Sunday. 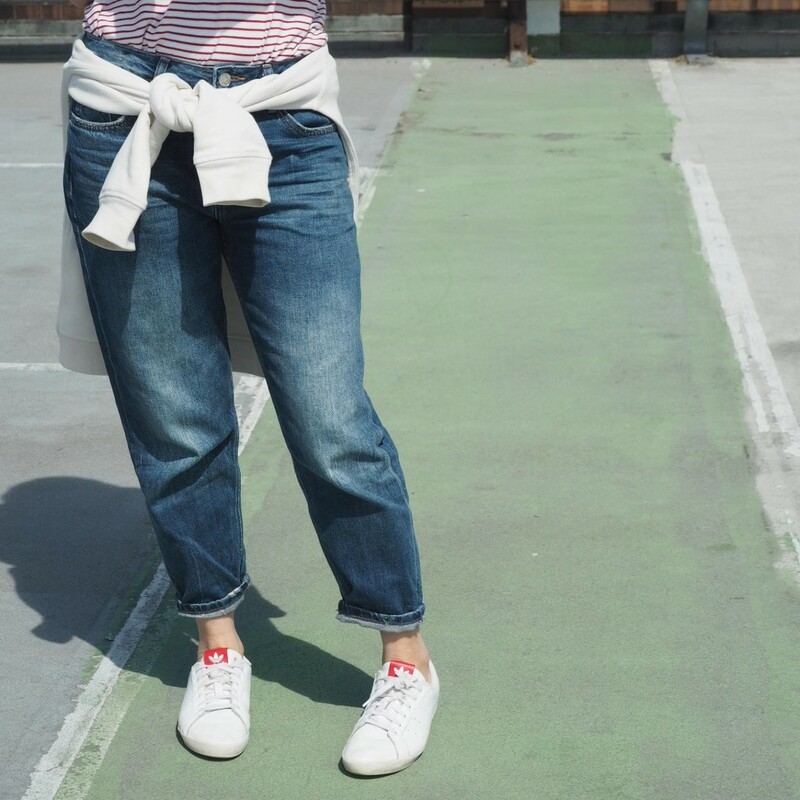 So what do you think of my boyfriend jeans: too baggy? Would you wear them? 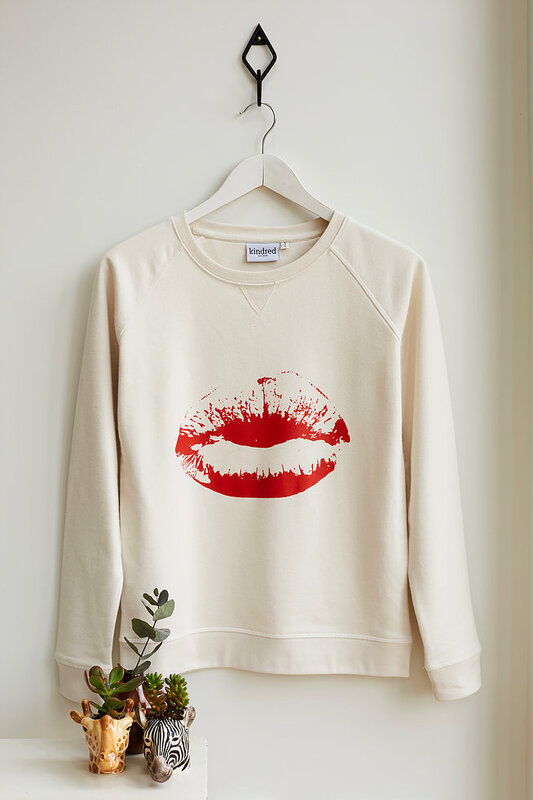 And of course, the Lip Sweatshirt… do you think you might #supportindependent and grab one of these or a tee? 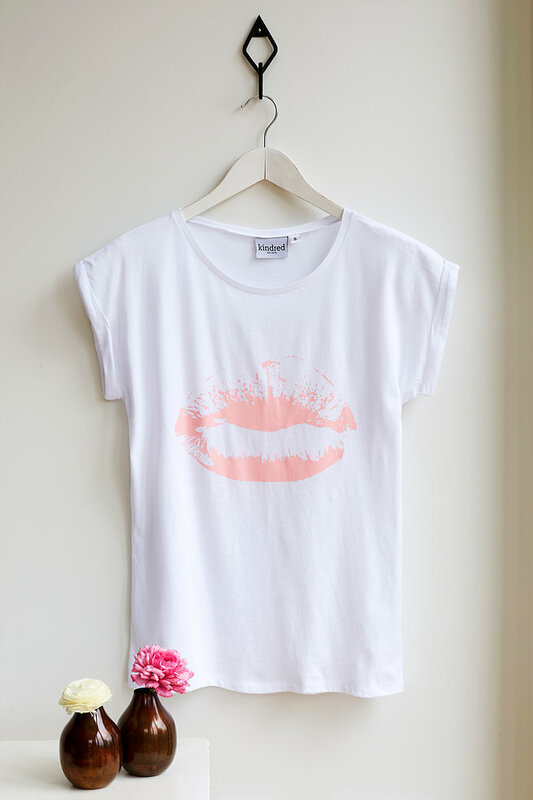 Keep an eye on the Wear Kindred site as there are new designs throughout the year… I think a pink lip or shell tee is what I might go for. Have a great week and see you all for another Sunday 7! P.S. 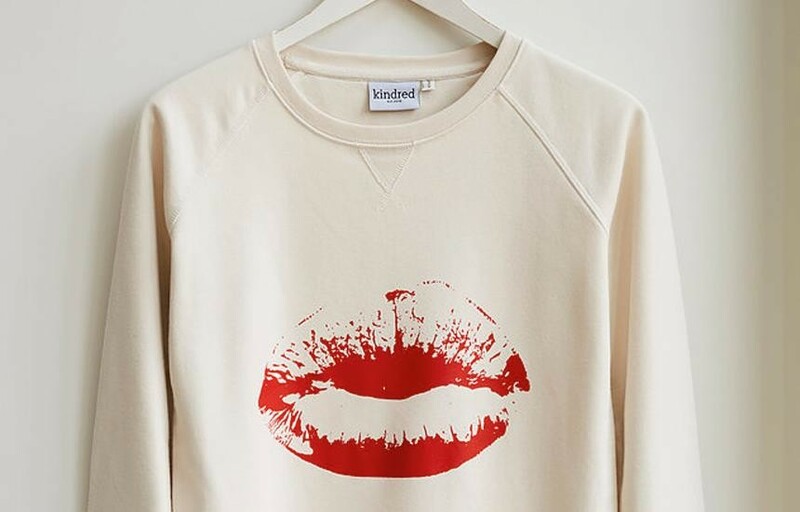 Just want to reiterate, I was gifted this Lip Sweatshirt but there are no affiliate links in this blog post, and that this was a genuine little “thank you” post to Haley @wearkindred. 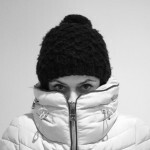 You look fabulous in the sweatshirt Bean…..love it! You are absolutely rockin’ those Topper’s Hayden’s too! Aw thank you Michelle! My mum will hate these ‘boy jean’ as she’ll call them (in the singular!) but my inner teen rebel is alive and well!! I love these jeans! I have similar from Marks & Spencer, but like the Topshop ones even more. Sunday 7 – Shoes for Spring and beyond!